Homeplace is a unique Vermont Bed and Breakfast, welcoming you with comfortable beds, full country breakfasts, European antiques, Vermont craftwork, and charm. Located halfway between Lake Champlain and Mount Mansfield in Northern Vermont, Homeplace B and B serves the University of Vermont and the Burlington area, as well as providing a pleasant stay on the way to Montreal. At Homeplace, you have a choice of double or single beds, all with extra pillows and fine linens. Some rooms come with private baths, and cribs are available. The large living room features more window than wall, and the entire house looks out on perennial gardens that change with the seasons. We'll serve you a full country breakfast each morning between 7:30 and 9:00. If you stay long enough, you can try all of the different daily options: homemade breads and muffins; pancakes from scratch with homemade maple syrup; or eggs fresh from the hens, with local farm bacon. There's always Vermont cider, a selection of teas, and fresh-ground Vermont-roasted coffee. 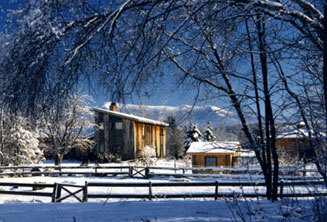 Homeplace has miles of cross-country and hiking trails. For those who prefer indoor recreation, we offer wireless Internet (WiFi), and books for all ages in almost every room – including hundreds of children's books in the back hall. You'll also find puzzles, chess, mah-jong, and other games in the corner of the living room by the piano. We're about half an hour away from Burlington, and less than an hour from Shelburne and Stowe. Ask us about the area's many restaurants. Between the mountain and the lake, there's something for every taste and budget. Two friendly dogs join your hostess, Mariot Huessy, in welcoming you to this quiet place in a hundred-acre wood.